This article originally appeared in the Alumni News of The Citadel – Summer 2014. It is reprinted here in its entirety with the permission of the Citadel Alumni Association. 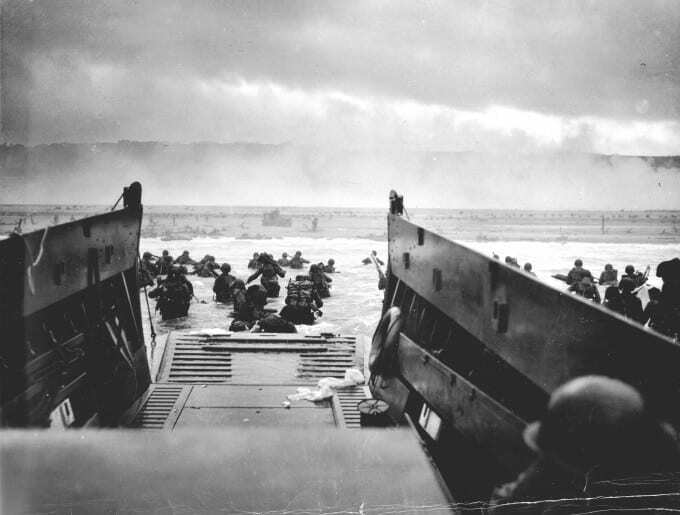 The observance of the 70th anniversary of the D Day landings in Normandy poignantly reminds us that those young men who embarked upon that great crusade and were fortunate enough to have survived are in their eighties and nineties now. Even as this article was written, The Citadel’s most decorated veteran of WWII, Colonel Theodore S. “Ted” Bell, class of ’42, recipient of the Distinguished Service Cross, the Silver Star, and two Bronze Stars, who fought with the 77th Infantry Division in the Pacific, passed away at the age of 93. We are fast approaching that point in time when memory will forever pass into history. It is incumbent upon we who are the recipients of the fruits of their sacrifice to take a few minutes to remember the exploits those who were there. Of course, the exploits of Major Thomas D. Howie, class of 1929, “The Major of St. Lo”, commanding officer of 3/116th Infantry Regiment of the 29th Infantry Division seventy years ago are, or at least should be familiar to alumni. Howie, serving as operations officer or S3 for the 116th Infantry Regiment landed with the third wave on OMAHA Beach at H+70, June 6, 1944. Five weeks later on July 17 during the operation to liberate St. 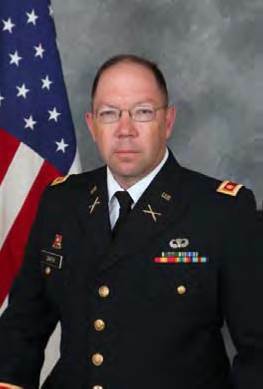 Lo and four days after taking command of 3/116, he would lose his life in that attack on Martinsville ridge; an action for which he was awarded the Silver Star. His home town of Abbeville, South Carolina, St. Lo, France, and The Citadel all have memorials to his memory, “Dead in France, Deathless in Fame” his grave in the Normandy American Cemetery is one of the most visited in the cemetery. There are other alumni who are less well known or even remembered. What follows are a few of those stories. Major Howie was not the first Citadel alumnus to land at OMAHA Beach. That distinction goes to Private First Class Thompson Gallety Dicks, class of 1944, assigned to A Company, 1/116th Infantry Regiment landing in the first wave on the Dog Green sector at H+1. Within ten minutes of landing, the murderous grazing and plunging machinegun and mortar fire rendered the unit combat ineffective with Dicks and over two thirds of his company, many from the town of Bedford, Virginia, dead or dying on that beach forever known to history as “Bloody Omaha.” Bedford Virginia is home to the National D Day Memorial. Thompson’s father, Colonel John Leon Dicks, class of 1918, had his son’s remains permanently interred in the Normandy American Cemetery. Another OMAHA Beach casualty is First Lieutenant Robert Moffatt Brice, class of 1942 who came ashore with B Company 2d Ranger Battalion at H+60 on Dog Green sector. Brice was first off his landing craft and motioning to his platoon saying, “Let’s go!” only to be promptly cut down by machinegun fire. In 2005, a family in France who had acquired Brice’s helmet some fifty years earlier put it up for auction on eBay. The American Military Museum purchased the helmet and later acquired Brice’s footlocker and other artifacts from his widow and younger brother, retired Virginia district court Judge James P. Brice, VMI class of 1947. Brice also rests in Normandy American Cemetery. At 05:35 Captain James G. Thornton, class of 1940, Commander of B Company, 741st Tank Battalion was the first of 32 amphibious “Duplex Drive” tanks launched into the sea almost four miles off Omaha Beach. Thornton’s tank and twenty-six others almost immediately wound up at the bottom of the English Channel. Thornton reported, “Some crews were buried at the bottom of the Channel; some tank crews got out of their tank and were swimming in the water, until being picked up by Navy boats taking some to the hospital ship, some to the beach.” A passing landing craft rescued Thornton and his crew and took them to a transport, where they were furnished with dry clothing. Thornton succeeded in getting transportation to the beach on D+1, where he joined an infantry platoon that was moving inland. After locating the battalion area, he left the platoon and rejoined his unit. Thornton would survive D Day but would be declared missing in action September 14, 1944 near the German/Belgian border. Bodies of eight American paratroopers lie outside the wreckage of their glider on D-Day. Private Henry Major Taylor, class of 1939 rode a glider into Normandy with Headquarters Battery, 320th Glider Field Artillery battalion, 82d Airborne Division. After a controlled crash into Landing Zone Whiskey near Les Forges, France in the early evening of D Day, Taylor’s unit encountered severe and heavy small arms and mortar fire. 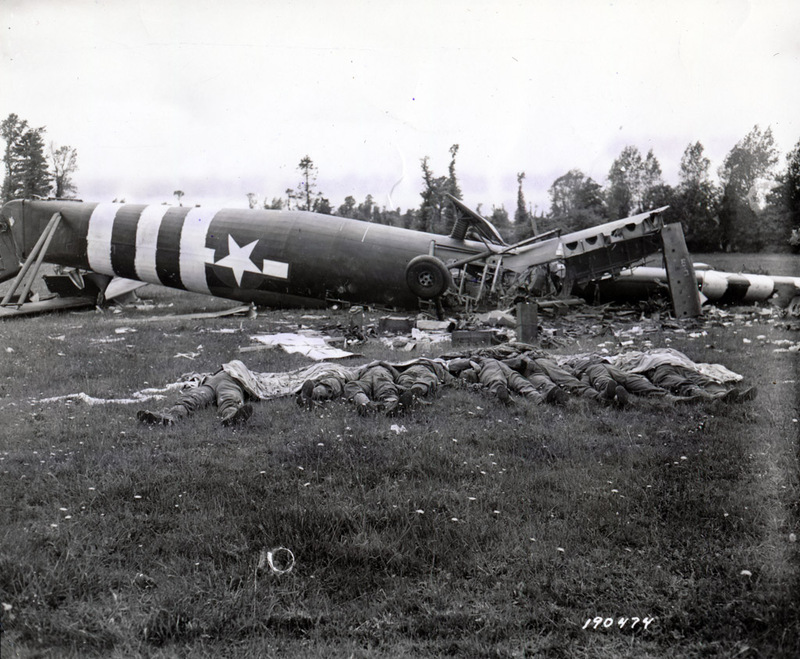 It is unknown if Taylor died in the crash of his glider or by enemy fire. His family elected to have his remains returned for burial in Greenwood, South Carolina. During the early morning hours of June 7, 1944, the USS TIDE (AM-125) was conducting minesweeping operations off UTAH Beach and the Carentan estuary between St. Marcauf and Barfleur to clear lanes for the increasing number of follow on transport ships. TIDE drifted over the Cardonet Banks and struck a mine that exploded with such force that it lifted the 890-ton ship out of the water breaking her back. The force of the explosion killed at least eight of Ships Company and injured many of the ninety-seven others. Mortally wounded in the explosion, TIDE’s commanding officer Lieutenant Commander Allard Barnwell Heyward, class of 1931, died on the bridge shortly after turning command over to his executive officer. TIDE sank in sixty feet of water within minutes of boats coming to her assistance and rescuing survivors. Heyward is memorialized on the Tablets of the Missing at the Normandy American Cemetery. 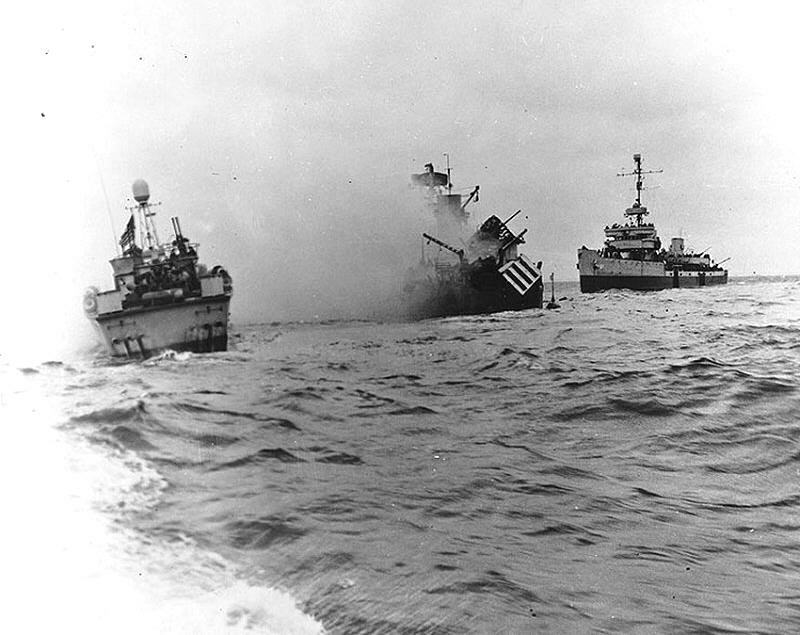 USS Tide (AM-125) Sinking, soon after hitting a mine off “Utah” Beach during the Normandy landings, 7 June 1944, Pheasant (AM-61) is standing by, off Tide’s bow and PT-509 is to the left. Later that same day, Captain Clough Ferrar Gee, III, class of 1939, was leading Green Flight of the 379th Fighter Squadron on his second mission of the day. Heading home after bombing railway lines and shooting up a locomotive near Argentan and Alencon, France, they were bounced from behind and below by four to eight FW 190s of I/JG 26 near Lisieux, France. Gee and another pilot were shot down. Gee’s P-47 “Bucephalus II” crashed near Fierville-les-Parce, about 15 Kilometers Southeast of Deauville, France. The local citizens recovered his body and buried him unidentified in the local church cemetery on June 9. Initially listed as Missing in Action, and without information to the contrary, the Army declared Gee dead in June 1945. After VE Day, graves registration personnel recovered, positively identified and reinterred his remains in the temporary US Military Cemetery at St. Andre de L’Eure on August 11, 1945 and then moved to the Normandy American Cemetery during the consolidation in June 1949 at the request of his father Colonel Clough F. Gee Jr. Among Gee’s awards were the Distinguished Flying Cross, and nine Air Medals. Thompson Dicks’ classmate, Sergeant Owen Willoughby Fields, Jr., who attended Officer Candidate School but was not commissioned “because he looked too young” landed at Uncle Red sector of UTAH Beach at H+210 with E Company, 2/22nd Infantry Regiment, 4th Infantry Division. On July 7, having been moved to an assembly area south and west of Carentan, Sergeant Fields and the 22nd Infantry went into the attack, entering one of its bloodiest engagements of the entire war—the Carentan-Periers operation better known as “The Battle of the Hedgerows”. The objective of this operation was the seizure of the city of Periers, necessary to Operation COBRA and the breakout from the peninsula. It was during this phase of operations that Sergeant Fields received a fatal shrapnel wound to the head on July 13, 1944. His father had his remains also interred in the Normandy American Cemetery. 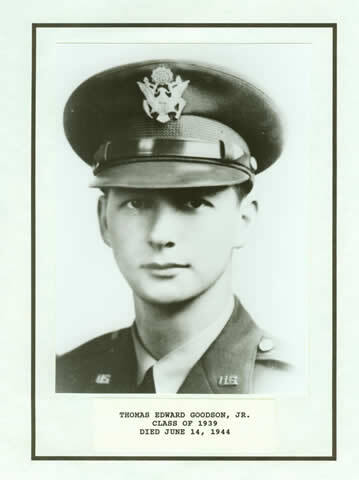 First Lieutenant Thomas Edward Goodson, Jr. class of 1939, serving as Executive Officer of G Company 2/401st Glider Infantry Regiment (later designated as L Company 3/325 GIR), 82d Airborne Division landed in Normandy the morning of D+1. Initially placed in reserve at St. Mere Eglise, the battalion conducted a frontal assault with Goodson’s company as lead in the fight to capture and secure the La Fiére causeway across the Merderet River. Goodson’s company commander was wounded and suffering from loss of blood turned command over to Goodson. Crossing the 800 yards of the causeway, the units involved sustained some 560 casualties and Army Historian S.L.A. Marshall called the fight for this causeway, “The costliest small-unit action in the history of the US Army”. The commander of the 82d Airborne Division, General Mathew B. Ridgeway called it, “the hottest single incident I experienced in all my combat experience both in Europe and later in Korea.” Goodson was killed in action while in command of the company on June 14, as it fought to expand the bridgehead across the Merderet, liberate the town of Saint Sauveur Le Vicomte, and secure the Douve line. 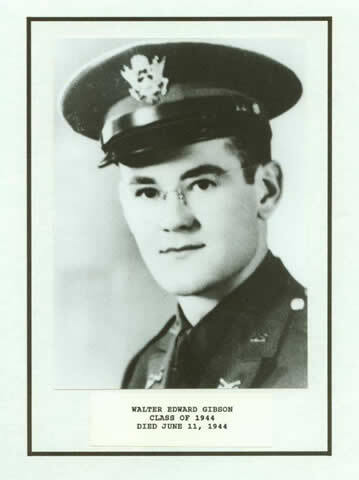 First Lieutenant Walter Edward Gibson, class of 1944, was assigned to the 4th Cavalry Reconnaissance Squadron. The Squadron was mainly equipped with the M8 “Greyhound” armored car and the 1/4 ton truck. Researching exact details continues, but it is believed that he was assigned to B Troop, which was attached to the 82d Airborne Division during the Normandy campaign. 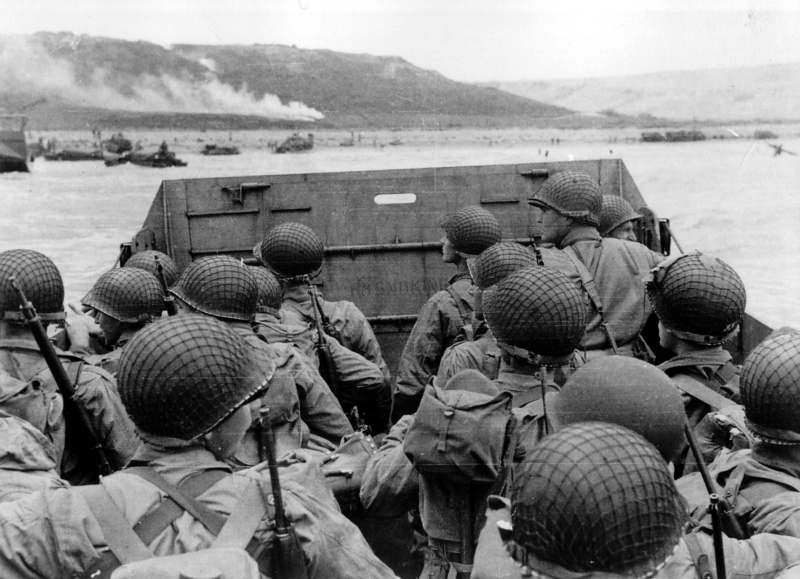 The 3d Platoon of B Troop landed at 0930 on D Day and pushed inland to link up with the 82d. The remainder of the Troop joined the 3d platoon on 10 June at St. Mere Eglise. Between 10 June and 14 June, the troop conducted numerous combat patrols near Gourbesville in the area West of St. Mere Eglise. On 11 June, the 2d platoon was ambushed near Gourbesville after it had penetrated the enemy lines on the main East-West highway. The Germans trapped the platoon as it returned on a secondary route and the entire platoon, with the exception of two men who escaped in a jeep were either killed or captured. It is believed that it was during this ambush that 1LT Gibson was killed. There are many more stories of our WWII alumni, but space limitations do not permit them all in the space allowed. As mentioned earlier, we are fast approaching that point in time where memory will pass into history and we will no longer be able to hear and learn from those who were there. It is therefore all the more important that we take time to remember the stories and sacrifice of our Citadel Patriot dead who have immortalized our core values by performing their DUTY, serving with HONOR, and sacrificing their lives, we owe our eternal RESPECT.